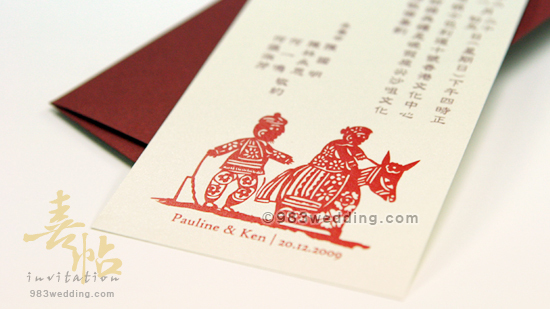 This design features a Chinese traditional paper cutting character – Couple singing side by side. This wedding invitation design is very simple. It is a single card. The wording will be printed on this single card. To add some spices to the design two different paper cutting patterns are used here. The first one is a double happiness pattern. It is printed at the top of the card. The meaning of it is self-explained. In fact, you can feel the Chinese taste once you see this pattern. Another pattern is also very interesting. This pattern is printed at the bottom of the card. It depicts a couple staying together. They are walking side by side, singing and playing together. It is a blessing to the couple that they will stay together for a hundred years. 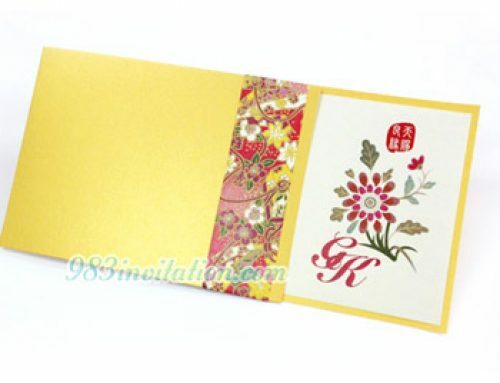 In order to make this card a modern Chinese one, the main colors used are off-white, red and dark brown. The off-white color is for the paper used. All the paper cutting patterns are printed in red. 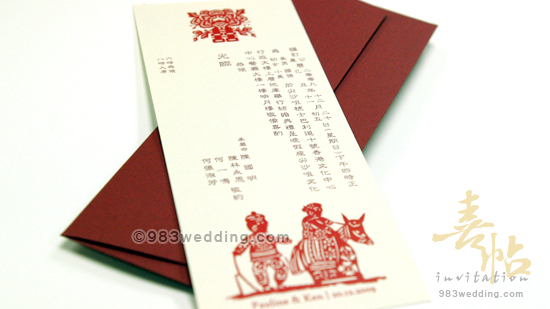 On the other hand, wording and information of your wedding will be printed in a dark brown color. At the same time, the color of the envelope will be in deep red color. 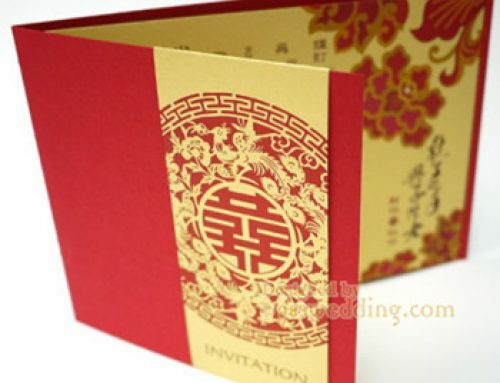 The choice for the color of the envelope is mainly due to the notion of Chinese traditions. All these colors will suit your needs for a Chinese wedding. Although the original choice of paper is off-white in color, it does not mean that it is something fixed. There are always possibilities to make changes to the design. It is possible to change the paper stock to other colors. 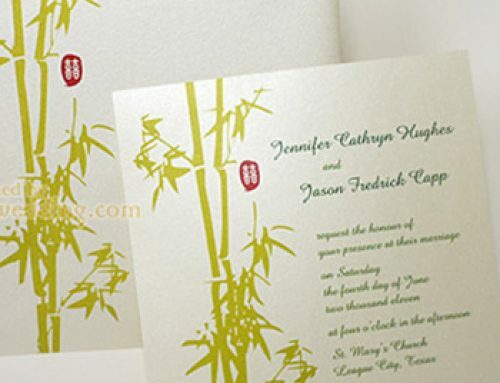 For example, some brides and grooms may consider changing it to yellowish gold color. 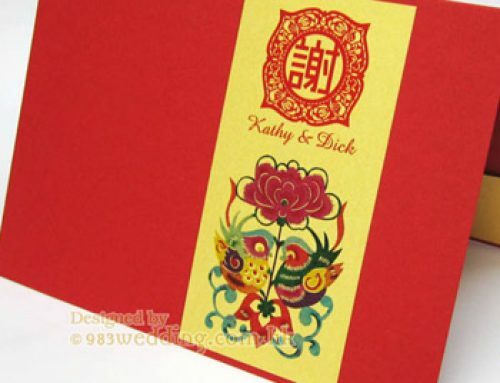 When making such a change, the card will look more Chinese because the color combination will become dark brown, red and yellowish gold. There are also brides and grooms who may want to change the color of paper stock to pink. It is also possible to change the colors of the prints. However, we may need to do some test and design work in this case. Please feel free to contact us if any information is needed about this matter. It is possible to make this card a bilingual invitation. Two languages will be printed on each side of the card separately when it is needed. 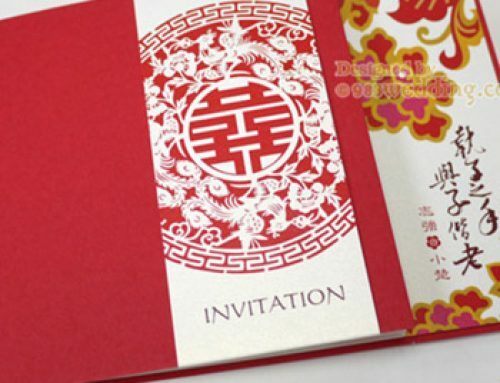 300gsm creamy color pearlized paper with full-color printing on ONE side.